Synthetic riboswitches constructed from RNA aptamers provide a means to control bacterial gene expression using exogenous ligands. A common theme among riboswitches that function at the translational level is that the RNA aptamer interacts with the ribosome-binding site (RBS) of a gene via an intervening sequence known as an expression platform. Structural rearrangements of the expression platform convert ligand binding into a change in gene expression. While methods for selecting RNA aptamers that bind ligands are well established, few general methods have been reported for converting these aptamers into synthetic riboswitches with desirable properties. We have developed two such methods that not only provide the throughput of genetic selections, but also feature the quantitative nature of genetic screens. One method, based on cell motility, is operationally simple and requires only standard consumables; while the other, based on fluorescence-activated cell sorting (FACS), is particularly adept at identifying synthetic riboswitches that are highly dynamic and display very low levels of background expression in the absence of the ligand. 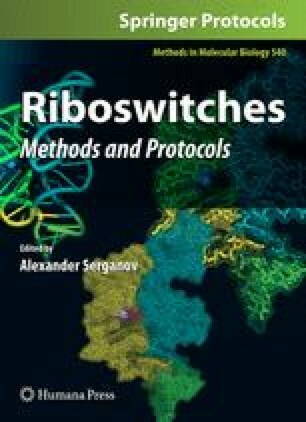 Here we present detailed procedures for screening libraries for riboswitches using the two methods. Work in the Gallivan lab work is supported by the NIH (GM074070). J.P.G. is a Beckman Young Investigator, a Camille Dreyfus Teacher-Scholar, and an Alfred P. Sloan Research Fellow. S.A.L. is an NSF Problems and Research to Integrate Science and Mathematics (PRISM) Fellow. S.T. is a G.W. Woodruff Scholar and an ARCS Fellow.